An easy-to-use, highly characterful and effective sound design plugin for the best of us... and the rest of us! Warm sound. Highly versatile. Excellent modulation matrix. No undo for Modulation Reset. No metering. Inear Display's novel delay and pitchshifting plugin, Incipit (VST/AU), comprises three identical effects chains feeding into a multimode filter, with modulation provided by four LFOs and three macros, all assigned in a rather brilliant modulation matrix. Each of the three chains can achieve a range of detuning, harmonising, delay and chorusing effects on its own, but when used together, they're capable of much more. Chains 2 and 3 can each be set to run in parallel or take their feed from the preceding chain. In parallel, incredibly rich layered textures are the order of the day, while in series, things move into serious timbre- bending and sound-mangling territory. The first section of each effects chain hosts a +/-24-semitone Pitch Shifter that speeds up or slows down the incoming signal to achieve tape- style re-pitching, rather than maintaining the playback speed. It does this by slicing the audio into 'grains', the size of which is adjusted using the Size dial. This is supposed to be a corrective control, but it's actually more useful for working a cool sort of 'flanged' texture into the sound. The pitchshifter's output can also be fed back into its input for a metallic chorusing effect. Next comes the Delay section, offering Mix and Feedback controls, and unsynced or synced delay times from 1-1000ms or 1/128 to 8 bars. This range suggests that it's designed with creative sound design very much in mind. At the end of each chain are Level and Pan knobs, for setting the volume and stereo positioning of the three processed signals before they're mixed at the output section below and shoved through a four-mode filter - low-pass, high-pass, band-pass and notch - with resonance, cutoff and Dry/Wet mix controls. So far, it's all pretty simple stuff, but the effects modules really come to life when the four LFO modulators are brought into play. The LFOs have seven shape options and a button for switching their frequency range between 0.001- 20Hz and 20Hz-1kHz, the faster settings giving rise to some interesting FM-style modulations. The three Macro knobs, meanwhile, are each assignable to multiple controls in the Matrix, enabling simultaneous one-knob manipulation of complex parameter combinations. Finally, for instant sound design inspiration, there's also a Randomizer section, consisting of four buttons for randomising the parameters of the LFO, Matrix (where only those modulations already assigned are affected), FX and All sections, and a dial for setting the amount of randomisation thus applied. Given its apparent simplicity, the range of effects Incipit is capable of generating is surprisingly wide, including auto-panning, flanging, filtering, pitchshifting, bitcrush-esque and FM synthesis-style noises, 'turntable' stops, glitching and more - as showcased by the 68 excellent presets. The general sonic aesthetic is akin to that of an 80s dystopian sci-fi movie soundtrack - futuristically industrial rather than shiny and 'digital'. We think it'll find its niche as an impactful insert effect, but it works really well on an auxiliary bus, too, adding atmosphere to parts that are lacking in depth and character. 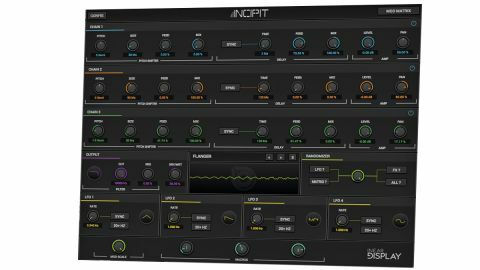 From ethereal textures to evolving dynamic effects and overt sound mangling, Incipit makes it so easy to create awesome new sounds that, at this price, it just can't be ignored.